Who is Beating the 'We MUST Vaccinate' Drum? I sat down recently to write about developments that are unfolding relative to the growing public consciousness and understanding of structured water, and instead wrote about the passing of Senator Edward M. Kennedy (1932-2009) and how it reinforced our perception of likely outcomes when dealing with brain cancer (and cancer in general) under current conventions of medical care. Whether drinking structured water would have changed the timing and circumstances of Senator Kennedy’s transition is subject to speculation, but all indicators suggest that doing so would have, as it would for all of us, irrespective of our state of health. To illustrate, I’ll now write about what I intended to cover in the first place. Our story begins with a group of plants, some really “contented” and now healthier cows from Arizona, and ends with unexpected developments from Germany. Getting a handle on this structured water concept can be a challenge for linear, “show me the numbers,” left brain-dominant people. Evidence is there, mind you, but you sometimes have to look for it differently. As a first impression, upon taking my first shower with structured water, I noticed that it feels “wetter” than what was coming out the showerhead only minutes before. I now understand that this feeling is what is generally referred to as “soft.” This is one indication of smaller cluster sizes and higher density and hence greater oxygen content in the water. Structured water shows great promise as a salt-less water softener. And as this missive moves along, you’ll see another area of great potential. Another piece of evidence of higher available oxygen content in structured water is in how it affects living things that don’t have intellects and egos. Plants and animals qualify as part of that population. A simple test was to simply take a couple of plants and water them, with tap water, and with water that has been structured. 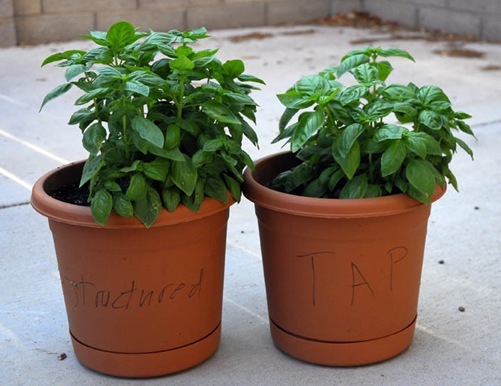 We did this with basil, actually purchasing three pots and a pack of seeds, which were planted. One pot was watered with tap water and another with structured water (run through the kitchen faucet that has an under-sink unit installed). The water of the third pot had first been warmed in the microwave, cooled off with some ice, then applied to the planet. While it did sprout, seedlings were sparse. It never thrived, and in a short period of time, was gone. The surviving plants grew up in the summer heat of central Arizona, where the ground surface temperature is easily enough to fry eggs by day, and perhaps run “slow cook” food by night. Yet, during this time, the both plants pushed through the surface and formed according to design. The plant that was nourished with structured water eventually grew larger, and proved to be the more robust of the two. That the plant fed with structured water grew larger might have been expected, though if that weren’t the case, I would have written that too. What was not expected was seeing that the structured water-fed plant was robust beyond size. Day-after-day, as the summer intensity reached its zenith, the air temperature rose well over 100° (F.), frequently between 110° and 115° reaching as high as 119°. I didn’t choose to cook any eggs, but the ground surface temperature, which radiated back on the plants too, was easily able to do so. The unexpected observation had to do with sunburn. The tops of some of the leafs on the tap water fed plant began to brown, which could easily have been expected given the intense, direct sunlight heat it had endured each day. However, the leafs of the structured water fed plant remained a rich green, and was quite aromatic. This observation changed my understanding of our susceptibility to sunburn from sun exposure. The degree to which we may be susceptible to sunburn appears to be more a statement to the quality of the water that one is drinking (and hence, hydration), than sun radiation. More evidence to this notion comes from people who have experienced sunburn getting quick relief after taking a shower in structured water. The extra available oxygen restores the balance in the skin. 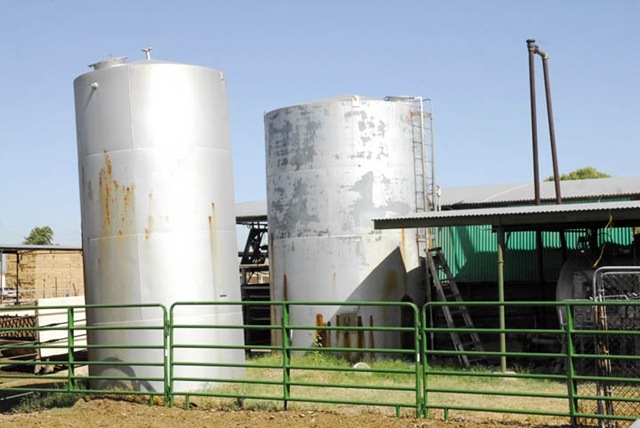 Buoyed by these developments and looking for more, I contacted a friend who owns the only dairy producing raw, unpasteurized milk in the state of Arizona, Jackie Calamos. It was Jackie who originally brought Sally Fallon Morrell (Weston A. Price Foundation), and Mark McAfee (Organic Pastures) to my attention. Both eventually became guests on my radio show, with my Organic Pasture’s visit being part of my first road trip in 2008 to Northern California. Listen to my conversations with the experts. Would you buy this milk if you didn't know the truth? An August 2009 article in the Washington Post reporting that 70% of children through young adult are deficient or insufficient in vitamin D, is chilling evidence that our undeclared “War on vitamin D” is going the same way our declared social “wars” — e.g., on poverty and cancer — have gone, with more people getting worse while the researchers, bureaucracies, and fund raising organizations got fatter. We have cultivated nutritional deficiencies through behaviors that are encouraged and discouraged, then blamed them on various factors, such as poverty and genetics. Government enforced pasteurization of dairy products, including the “organic” variety, are woefully lacking in real nutritional value that actually contribute to human health. Corporate milk producers often rely on chemicals such as recombinant bovine growth hormone, marketed as “rBST” to “pump up” milk production (dramatically shortening the cow’s life), and antibiotics to “control” the anaerobic microbial populations that get out of control. They then combine the milk product from different dairies, virtually erasing any way to truly produce a high quality product. In fact, given the standard production procedure and lack of quality controls, they pretty much have to kill and chemicalize the milk soup, or things would be even worse. Listen to my conversation with Gearld Fry, a bovine geneticist. 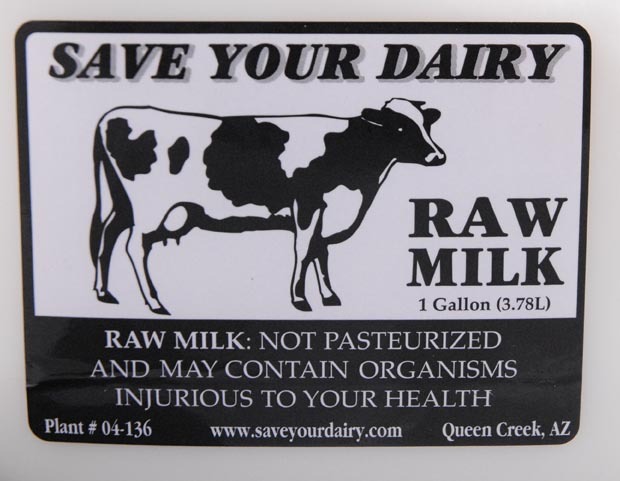 On the other hand, if they’re allowed to sell at all, raw milk producers are forced to include misleading labeling that most consumers won’t take the time to see beyond. Perhaps it is for that reason that Jackie Calamos named her operation, Save Your Dairy (www.saveyourdairy.com). However, she was excited about the prospects of learning about structured water, and after meeting Clayton Nolte, the device’s inventor, agreed to install two units, one that would structure the water that the cattle drinks. You can see the structuring unit just below the pump in the above image. Another unit was installed to structure the water that is pumped to a holding tank that supplies all the buildings on the property. You can see a close-up of the device in the picture below. 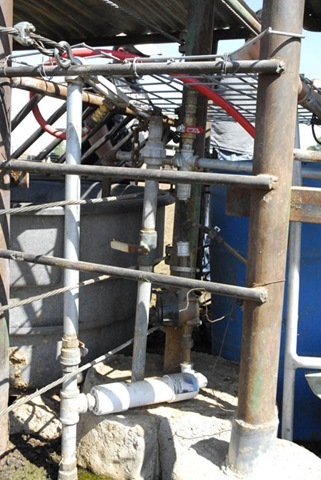 The first unit was installed in early July, after taking a couple weeks to measure the cows’ water consumption patterns. The second one was installed several weeks later. I visited the dairy in late August 2009, in the heart of Arizona summer, and talked to Mick, who manages the facility. They observed an immediate change in drinking patterns. The cows drank less water. The herd (130 head) had been drinking around 1,800 gallons of water per day for several days. Then, consumption would spike to over 4,000 gallons, then return to the lower level. After the structuring devices were installed, water consumption leveled off to around 1,800 gallons each day. 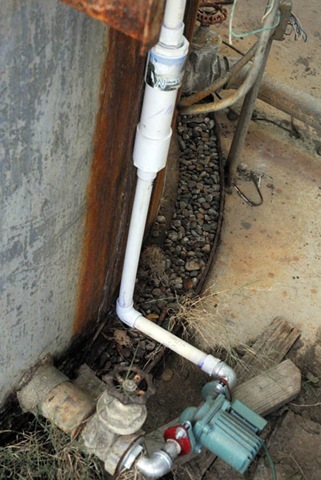 Most people who have not experienced the intense, energy challenging heat of an Arizona summer, might not appreciate just the significance of such a dramatic reduction by a herd of cattle, who, while curious, did not check the specifications, or inquire about what was being installed near the water trough. To need less water under such circumstances was truly remarkable. This turn of events supports an assertion of improved hydration, made possible by denser, more oxygen rich and “coherent” water clusters, as the cattle drank according to thirst, and stop when that thirst was satisfied. While this was a pleasant, and you might say “positive” outcome, it wasn’t enough for Mick consider the structuring devices had a significant impact. The real issue was that the water source that his cattle draw from, a nearby well, was believed to have a noticeable bacteria count. So Mick had a far greater problem weighing on his mind. If the well water indeed had a noticeable bacteria count, would a structuring unit fix that problem? Furthermore, the presence of an anaerobic microorganism in structured would be counter-indicated, because structured water is optimal, and living. The bio-photon energy that accompanies a structuring event manifests as abundant, stable oxygen. If the inventor’s statements were true, then there should not be a noticeable bacteria count in the herd’s drinking water. When I visited, the lab tests were still out, but it was a moot point by the afternoon. The lab results were in. The lab found NSG (non-significant growth) in the structured drinking water sample. He was one excited dude! No bacteria, produced with no antibiotics! Jackie is now the owner of the first dairy in the world to produce structured milk! On the heels of this development, an order came in for a Photonic Water garden unit. Destination, Elzweiler, Germany, about 130 Km southwest of Frankfurt. It’s amazing and gratifying to see how people from around the world are learning of this technology, as well as paying the prohibitive import duties — obviously set up to deter trade between nations — in order to avail themselves of the structured water experience. Now I remind you that you can structure water. Each human being can, and is a water structuring agent. The caveat is that we must be in a joyful, loving state. When we perceive ourselves as being “stressed out” we leave our structure hat at the door, and are at the mercy of whatever we feel vulnerable to. A water structuring device allows us to gain the benefits of being conscious of our innate power and using it, even when we aren’t. Within two weeks after that unit shipped to Elzweiler, a surprised Clayton Nolte, the unit’s inventor, received an email from the excited buyer, who indicated he had done tests on the water that flowed through the structuring unit. He said that a device they use to measure bio-photons had confirmed said emissions in water that had passed through the garden unit. They were gearing up to purchase more units of different sizes in order to expand their research. This was good news, even encouraging news, but not necessarily GREAT news, that is, until Clayton sent a copy of the report to me. Printed the front page was the name Fritz-Albert Popp. This didn’t mean anything to Clayton, but rung a bell with me. 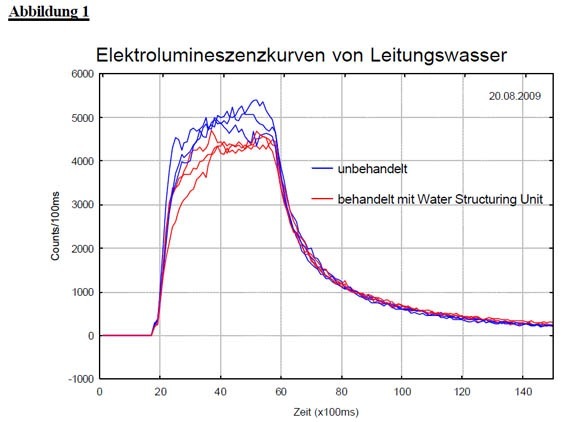 Blue graph lines are normal tabwater and red one for structured water-we use the water in Prof. Popp’s laboratory, where I directly connected the unit to the water source. 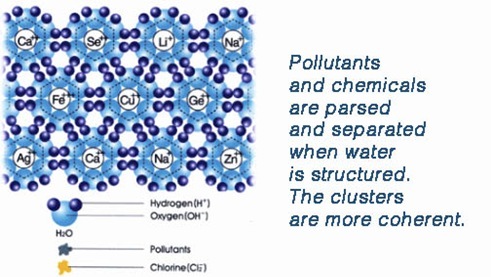 Distilled water would show effects in the same way, which means that our water has capsuled the micro-particles into clusters, so they can not react anymore. strong polluted water would have a higher score, because it has more dirt ( micro-particles) inside, which makes the water more electrolytic-more biophoton emisson-higher score! In this researcher’s paradigm, less is more. I mentioned being familiar with the name Fritz-Albert Popp, but initially, wasn’t sure where. It was from reading The Field: The Quest for the Secret Force in the Universe, by Lynne McTaggart. She devotes a chapter to his work, and includes numerous additional references throughout. Having your work independently and excitedly confirmed by a world renown bio-photonic researcher is a great way to start the day. I eventually found an excerpt from The Field on Albert-Fritz Popp and read it to Clayton, so he could further appreciate the significance of the point in time that we have reached. A new doorway has opened a tad more, as structured water history moves on. The implications of abating any anaerobe without resorting to antibiotics, by using less to achieve more desired results, is mind-boggling, if enough people like you and me wake up. When we stop fearing nature, and actually return home, we have much to learn, and to gain. And just perhaps, we can live in better health for less, which I’m sure Senator Kennedy would have preferred. Who is Beating the ‘We MUST Vaccinate’ Drum? This is the great post and you nicely describe the benefits of structured water in the photos.I like your way of writing the post. I am so happy with the news that Clayton Nolte invented and has achieved the manufacturing of a product to market that structures water for households! No moving parts, no filters or other things to maintain. I just ordered a portable unit to offer drinking samples and spread the news. Amazing blog.I have a A man can not spin and reel at the identical time. For that reason, we have to concentrate on everything what we do. I really enjoyed reading this article on the bio photons of water. Could you let me know if there is structured water treatments for domestic household use? Did you know that F.A. Popp has a recent book out on “Biophotonics: optical science and engineering for the 21st century”. Apparently Popp has also done some work studying the electroluminescence of raw milk. We hope to publish a paper on the subject before too long on the Bovine. BTW, what is the source of your water structuring units? I’d like to excerpt your story for the Bovine blog later this week. Keep up the good work! THANK YOU! It’s amazing to see how common interests produce complementary effects! The present source of the structuring units is the inventor, Clayton Nolte. The units are available through shop.understanding-mms.com/structuredwater.aspx. We received some great feedback from Popp’s researcher who heard the interview with Clayton. I believe a great connection has been opened. I also posted a podcast of a conversation I had with Gearld Fry, a bovine geneticist last year that you might find to be of interest. You can access it by clicking here. Excerpt away and best wishes! Adam, I’m busy and currently do not have the time nor money to purchase a unit. Having studied the original author that led to this application and Masaru Emoto’s “questionable” yet enlightening works and knowing Jim Humble’s integrity, I want to know if there’s any public domain drawings how to make one yourself. As Jim and you have pointed out, there are “vested” interests at work here. Rick Clayton or Whomever, for those of us that are less educated, I would appreciate a more specific and factual discussion of the attributes/links as to structured water and its benefits for agriculture, livestock and its capacity to inhibit the growth/existence of toxins, ie. bacteria and viruses. Arthur, there’s no “Rick Clayton” at this address. However, there is ample information available about “structured water” and the benefits that you are seeking to understand. This area of water science is yet emerging, and is not mainstream. You are also free to experiment yourself, as I did. The conclusions that you come up with will be your own. They are the best kind. : Leon: Edwards. on Does the Government ‘Own’ You?